An all-in-one meter that is both compact and convenient, the Illuminati Light and Color Meter is a unique tool for measuring both exposure and color as well as both ambient and strobe lighting. 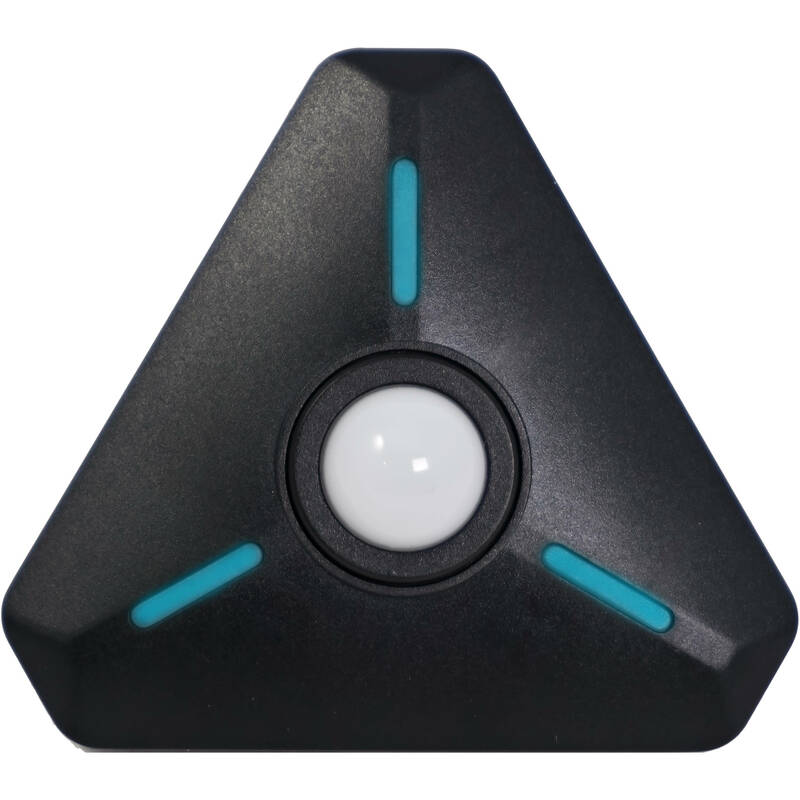 Beyond its metering capabilities, this meter distinguishes itself with Bluetooth connectivity along with a dedicated Illuminati app for complete control over the meter from your iOS or Android mobile device. This smartphone-based interface offers simple and intuitive control over the meter's functions, display exposure and color measurements, and also lets you simultaneously work with multiple meters for measuring lighting ratios or taking more exacting readings for highly controlled lighting situations. Complementing the distinct interface and wireless connectivity is a clever physical design that maximizes mounting versatility. In line with the wireless, smartphone-based operation of the meter, the meter is also designed for remote use and allows you to attach it to a stand using the 1/4"-20 mount; hang from a lanyard or strap; or attach to a variety of surfaces using the rear rare-earth magnet in conjunction with the included magnetic accessories. The meter's construction is also characterized by its spring-loaded retractable dome, compact triangular shape, integrated RGB LEDs for on-meter status alerts, and a 3.5mm jack for wired flash triggering. Box Dimensions (LxWxH) 5.6 x 4.1 x 1.7"
Light and Color Meter is rated 3.4 out of 5 by 14. Rated 3 out of 5 by Bruce from Somewhat Useful I bought this unit to try to balance my various LED lights, especially an Aadyn Jab that has a low color rendition index. But the meters color temp reading was way off compared to my Red camera. I double checked the Illuminati meter with a gaffers Sekonic 700 which confirmed the Iluminati was off. I think that the poor CRI of the light baffled the meters sensor but even the color temp reading of my HMI was off on the meter. I know preproduction Illuminati meters compared favorably in articles to the Sekonic 700 but... The foot candle readings were close to my Sekonic 308 so that part is accurate. It is easier to take a reading with the meter than using a camera. Rated 1 out of 5 by Mark F. from Not ready for Prime Time After 20+ years of purchasing from B&H? this is the first thing I've ever had to return. I had such high hopes for this and as a prolific flash and ambient light mix shooter, I so wanted it to work. Unfortunately mine would not meter flash (which is why I bought it) and the app is still in beta and frankly completely non-intuitive and buggy.? I was constantly notified of a Firmware upgrade, only to perform the upgrade and then it tell me the same upgrade is available. I couldn't even connect it via bluetooth for the first day, and I tried multiple devices.? Maybe it was just my copy but I notice another reviewer couldn't meter flash so to me that indicated this thing has gone to market way too early. When it did connect it would constant drop the connection for no reason and also when it didn't drop the connection it would just stop metering even the ambient light. I really hope they sort out their bugs in the app and product because if they can nail the UI then this will be a great product. It has so much potential.?? I've returned mine. Disappointed.. Rated 4 out of 5 by Mike from Bought it for the Color Temperature Meter functionality. Bought this to use while shooting for SXSW during the conference.? The conference rooms at the convention center have horrible ugly lighting.? I wanted a more accurate white balance than 'Auto' has provided in the past and this did the job.? I checked the readings against the meters used by the SXSW Video Crew and it was within 100 degrees Kelvin of what they were setting their gear to.? Close enough for me.? For still photos, the shutter / ISO / aperture settings needed some adjustment in the app but it was minimal and once fixed was rock solid.? The recent firmware update took a little assistance from tech support via Facebook but that too was simple to perform.? Attached to a lanyard and wore it around my neck with my credentials.? Got a lot of looks and asks since it was flashing like some crazy Deathly Hollows pendant. Rated 5 out of 5 by Ronald W. from Great Meter and Fun Too This meter is really cool. It is easy to set up, easy to use, and easy to carry. I have only compared the readings with my Canon 5DM4 metering a gray card so far. It appears to be accurate but I need to check it with regular light meters to verify that. The photographic results seem to be spot on. So far, it seems to do everything I would need in a light meter. It would be nice to have a similar unit for measuring reflected light, particularly with a spot meter capability. There is also the fun factor that really makes this metering process great. Place the meter in the same light that falls on your subject and start using white, gold, and silver reflectors and immediately get feedback on their effect. I did get this unit on sale so that made it even better. Rated 2 out of 5 by Mark from Most functions don't work. I really wanted to like this, but I can't get most functions to work. It does seem to give accurate readings for the color temperature and exposure of ambient light, but I haven't been able to get it to react to my strobes. It doesn't read their color temperature, and doesn't give me accurate exposure readings. I'm hoping they'll get the software bugs worked out. Rated 2 out of 5 by Nicholas from Good idea, but doesn't work Bought this to avoid paying for a color meter. Compared it to a friend's sekonic meter, unfortunately it was about 100 kelvin off and green and magenta pollution readings were way off. I also compared the light meter to my sekonic 858 and it was off by a stop or more. It sounds like a great idea, but it is not accurate at all. Maybe the next one. Rated 5 out of 5 by Lidia M. from Great little light Meter! I support them on Kickstarter.? Great for video shooters. They still work on the app and I think they will make some great stuff out of it.? My copy still didn't?get a flash metering?working but it will be fixed with firmware?updates. It will take some time. Great for checking white balance/exposure?for video.? Works on 2 AAAs. IOS/Android.? If you are shooting on film 35 definitely?helpful to meter ambiance light.